One pair of brackets per pack. Can be used with most deflecto® wall pockets. Deflecto Mounting Bracket - Sturdy, break-resistant brackets, made of metal, adjust to fit partition walls 1 5/16 to 3 1/6" wide. 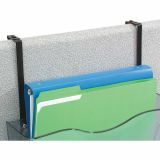 Great for mounting tilt bins or file pockets to cubicle walls. 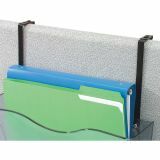 Includes two brackets and screws."